Adds templates for creating new JavaFX FXML Nodes and Applications. Netbeans plugin for creating standalone FXML Nodes to JavaFX projects. FXML file, representing the scene graph of the node. Java class file, which works as both the root and controller of the FXML. 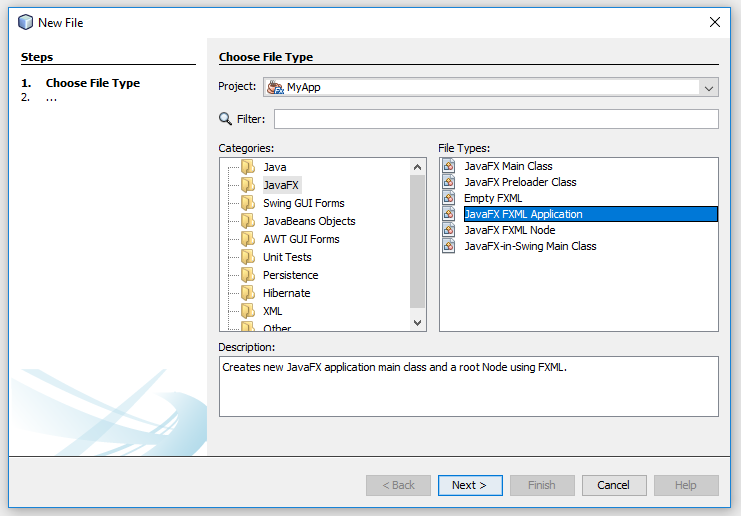 The Java file works as a standalone Node, meaning it can be added as a child to other Nodes. The two files of an FXML Node, as described in the previous section. The node is used as the root node of the application. The new file types can be found in the "New file" dialog under the JavaFX category.